This week’s lesson covers James 3:13–4:10 and seeks to explain true wisdom, advising the reader to choose to use “heavenly wisdom” instead of “earthly, natural, or demonic” wisdom. The objective is noble: to teach Adventists to live their lives by moral principles instead of indulging the urges of the flesh. Unfortunately, however, this lesson speaks of learning wisdom much as one would attempt to persuade someone to decide to change a bad habit into a good habit. Interestingly, the lesson does not give the Bible’s definition of wisdom. The writer does attempt to describe the differences between earthy and heavenly wisdom, but he does so primarily by identifying the characteristics of and behaviors associated the practice of earthly wisdom and contrasts those with the fruit of heavenly wisdom. 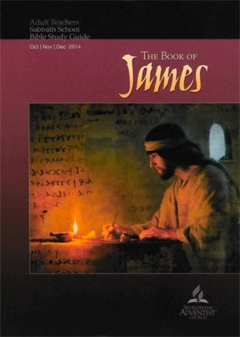 For example, page 91 connects heavenly wisdom with the “Word being ‘sown’ in peoples hearts” resulting in behavior that is “full of mercy” and “good fruits”, as James 2:13 says. By contrast, earthly wisdom is characterized by references from Proverbs as destructive, jealous, selfishly ambitious, and producing disorder and dissension. The lesson tends to define “wisdom”, whether earthly or heavenly, by the behaviors each produces. In fact, the Bible gives us quite specific definitions of true wisdom, but these are not mentioned in the lesson. The fear of the LORD is the beginning of wisdom, and the knowledge of the Holy One is insight (Proverbs 9:10). True wisdom is founded on fearing God—the triune God revealed in Scripture, the One God expressed in three persons, Father, Son, and Holy Spirit. The word translated LORD is the English rendering of the personal name God revealed to Moses: Yahweh. It is not sufficient to say wisdom is founded on the fear of “God”—however one perceives Him, because only the God revealed as Yahweh is the One God in three persons. The text above reveals even more than the fact that the fear of the LORD is the beginning of wisdom; it reveals that the knowledge of the Holy One is insight. In other words, knowing God, knowing the truth about His attributes and character that He has revealed in His word, gives one true insight. Thus we cannot begin to comprehend James’s instructions unless we first understand the Old Testament’s declarations about the LORD God. The wisdom from heaven of which James writes is not simply moral discernment and good choices. It is actually knowing the truth about our sovereign God, knowing that the proper response of sinful humanity must be to fear Him because He alone holds the power of life and death, or mercy and judgment. “On the other hand, it is written, ‘You shall not put the LORD your God to the test” (Mt. 4:7). Jesus applied this command from the Torah to Himself. Satan knew Jesus was his creator, and Jesus applied the title of God to himself. This understanding that the Lord Jesus is one with the Father and shares the personal name of God, Yahweh, the LORD, is part of the “knowledge of the Holy One” which is insight. Knowing this fact is part of fearing the LORD and beginning to be wise. The Bible contains two letters which Paul wrote to the disorderly church in Corinth. They were divided into factions and clamoring for the spectacular gifts of the Spirit; they were disrespecting each other when they gathered to eat the Lord’s Supper meals, and they were behaving according to the flesh much of the time. In his first letter to them, Paul leads with two chapters addressing the differences between worldly wisdom and wisdom from God. These passages, significantly, are not addressed in this week’s lesson, yet they disclose some of the clearest teaching about true wisdom in all of Scripture. The heart of Paul’s discussion of wisdom from God is the cross of Jesus. Where is the one who is wise? Where is the scribe? Where is the debater of this age? Has not God made foolish the wisdom of the world? For since, in the wisdom of God, the world did not know God through wisdom, it pleased God through the folly of what we preach to save those who believe. For Jews demand signs and Greeks seek wisdom, but we preach Christ crucified, a stumbling block to Jews and folly to Gentiles, but to those who are called, both Jews and Greeks, Christ the power of God and the wisdom of God. For the foolishness of God is wiser than men, and the weakness of God is stronger than men (1 Corinthians 1:18-25). Knowing that the cross of Christ is where God has revealed His wisdom is part of the fear of God that is the beginning of wisdom. If we are not accepting that the death of Jesus, His blood poured out for our sin is the heart of God’s wisdom, we are functioning in earthly, demonic wisdom instead of in God’s wisdom. Moral decisions do not identify wisdom. Unbelievers can have stringently moral lives, and they are not wise. Only those who recognize their need for a Savior and humble themselves before the Lord Jesus, receiving the payment of His blood, can possess heavenly wisdom. “What no eye has seen, nor ear heard, nor the heart of man imagined, what God has prepared for those who love him”—these things God has revealed to us through the Spirit. For the Spirit searches everything, even the depths of God. For who knows a person's thoughts except the spirit of that person, which is in him? So also no one comprehends the thoughts of God except the Spirit of God. Now we have received not the spirit of the world, but the Spirit who is from God, that we might understand the things freely given us by God. And we impart this in words not taught by human wisdom but taught by the Spirit, interpreting spiritual truths to those who are spiritual. The natural person does not accept the things of the Spirit of God, for they are folly to him, and he is not able to understand them because they are spiritually discerned. The spiritual person judges all things, but is himself to be judged by no one. “For who has understood the mind of the Lord so as to instruct him?” But we have the mind of Christ (1 Corinthians 2). In this chapter Paul explains that true wisdom comes from the Holy Spirit. Within Adventism, the Holy Spirit is not understood as the One who effects our new birth when we believe in the Lord Jesus. Rather, Adventism teaches that one receives the power of the Holy Spirit through praying for Him and longing for the “latter rain”. The New Testament teaches that every person who believes in the Lord Jesus is indwelled by the Holy Spirit. He does not come to those who mentally agree that Jesus died, but He brings spiritual life to those who recognize they are dead, intractable sinners who have no hope of ever pleasing God apart from bowing before the cross of Christ in repentance and in acceptance of Jesus’ blood on their behalf. Adventism sees the new birth as whatever it is that happens when one accepts the Adventist message, begins to keep the Sabbath, embraces the Ten Commandments, and adopts the health message. They do not understand the new birth to be literally passing from death to life (Jn. 5:24) and being transferred by God from the domain of darkness into the kingdom of His beloved Son (Col 1:13). The Bible, however, ties the Holy Spirit’s presence in a person with accepting the cross of Christ. Jesus’ death was not a representative death by which He symbolically demonstrated God’s love and forgiveness which we just have to accept. Rather, His death was substitutionary. He died specifically for each of us, bearing our personal sin in His body on the cross (2 Cor. 5:21). Paul’s discussion in 1 Corinthians 1 explains his description of heavenly wisdom from the Spirit in 1 Corinthians 2. Without embracing the death of Christ on the cross for one’s sin, there is no heavenly wisdom for anyone. James is exhorting his readers, the first Jewish converts to Christianity, to live according to heavenly instead of earthly wisdom. James can ask his readers to make this choice because they have believed in the Lord Jesus and been born again. They have believed that Jesus fulfilled the law and has become their righteousness and intercessor; they know that they have been brought to spiritual life through belief in Him. It is utterly useless to exhort people to live by heavenly wisdom if they have not been born again through responding to the gospel. Natural humans are born dead—dead in sin, by nature children of God’s wrath (Eph. 2:1-3). No one can seek God or please Him by deciding to do so. It is utterly impossible for any person to desire or seek God apart from God’s calling Him and opening his heart to the gospel (Romans 3). From inside an Adventist worldview, the attempt to exhort members to live by the wisdom from heaven is nothing more than an attempt to teach moral behavior to people who are naturally tending to protect and defend their own self-interests. Because we are born spiritually dead, utterly depraved, we are unable to make a choice for “good”. As natural people we can make all sorts of choices, both to do good deeds and to do destructive deeds, but those choices do not yield God-pleasing behaviors. Even good works generated from an unregenerate, depraved heart will not please God or be counted as “credit” to our heavenly account. On the other hand, when a person believes the gospel and recognizes his or her depravity, bowing before the crucified and risen Lord Jesus as one’s personal Savior, he passes from death to life and is indwelled by the Holy Spirit (Eph. 1:13-14). Only then, as a spiritually alive (instead of dead) human being, can a person actually make a choice to please God—or not. Romans 7 describes in detail the ongoing struggle we have as born-again believers living in mortal flesh. Paul states that we have a law of sin in our members (Rom 7:23) that wars with our minds which now love God’s law. He goes on in chapter 8 to explain that the only answer to this dilemma is the fact that, when we are born again of the Spirit, “there is now no condemnation for those who are in Christ Jesus” (Rom. 8:1). He continues by explaining that, as those who have the Spirit of God indwelling them, we are to exercise our ability to choose to please God, to live by the Spirit. The non-born-again person does not have this choice available at all. Only those who are born again can choose to trust Jesus at the moment of temptation and to react by the Spirit’s power instead of by our flesh and will-power. Thus, only those who are really born again are able to function with the wisdom of heaven that is our privilege as born-again and adopted sons and daughters of God. The core of this quote is the misquote of James 2:13. The lesson states that “mercy triumphs even in the judgment”. The wording is clear; this sentence refers to God’s judgment. “The judgment” does not refer to humans judgments of one another; it refers to the Day of the Lord. If you really fulfill the royal law according to the Scripture, “You shall love your neighbor as yourself,” you are doing well. But if you show partiality, you are committing sin and are convicted by the law as transgressors. For whoever keeps the whole law but fails in one point has become accountable for all of it. For he who said, “Do not commit adultery,” also said, “Do not murder.” If you do not commit adultery but do murder, you have become a transgressor of the law. So speak and so act as those who are to be judged under the law of liberty. For judgment is without mercy to one who has shown no mercy. Mercy triumphs over judgment (James 2:8-13). This passage is one of Adventism’s proof-texts for keeping the Ten Commandments. Yet this passage is not saying the Ten Commandments continue to have authority over Christians. First, it identifies the Royal Law of Scripture not as the Ten but as the passage from Leviticus 19:18 commanding us to love God with all our hearts and our neighbor as ourselves. It is this, not the Ten, that are identified as the royal law of Scripture—the law which Jesus said was the greatest commandment. Moreover, this passage further identified the “royal law” as part of the whole law that includes the Ten Commandments. James is saying that if a person breaks any command in the Torah, he is breaking the whole law, and the law convicts those who break it. If any tiny portion of the law is broken, the law-breaker is condemned by that very law—sentenced to death. Therefore, James is saying, don’t live by the law that condemns. Now, as born again Christians, live by the “law of liberty”. The Torah and the Ten Commandments are not the “law of liberty”. The law of liberty presides over a life of mercy. No one can extend true mercy apart from the grace of God, apart from being made alive by the Holy Spirit. So, James says, if we are unmerciful, we will be judged without mercy because we are putting ourselves back under the merciless law. But mercy triumphs over judgment. In other words, if we are merciful, loving our neighbors as we love ourselves, mercy triumphs over judgment. Mercy triumphs over our natural impulse to judge and argue with another, and mercy triumphs over the judgment of the law against us. If we are filled with the Holy Spirit and living by the Spirit, mercy triumphs; the condemnation of the law does not have the last word over our sin. Mercy triumphs. The lesson seriously twists the text by saying “Mercy triumphs even in the judgment.” The implication of the lesson’s rewording is that God will be merciful in the judgment because God is merciful. This is not remotely what the passage says. God is just—and His mercy would be inconsequential if He were not just. God judges sin. He will destroy sin, and the unrepentant will be sent into an eternity of judgment. It is because God is just that His mercy is so profound. God judged sin in Jesus on the cross. When we bow before Him and repent, receiving Jesus’ blood as payment for our sin, we pass from death to life and receive God’s undeserved mercy. Mercy triumphs over judgment only when we accept God’s judgment on our sin in the person of Jesus. When, however, we understand what God has done for us, we are able—for the first time—to exercise true mercy toward another. Mercy does not mean negating the sin of those who sin against us. It does mean that we leave ultimate judgment up to God instead of meting it out ourselves, and treat others with mercy as God has been merciful to us. We do not overlook the faults of others if they truly sin against us. Scripture has instructions for dealing with those against whom we have grievances. Moreover, Scripture commands us to judge teaching and practices as truthful and biblical or as heretical. We are commanded to defend the faith and to refuse to be caught up by false teachers. We must judge. What we do, however, is to leave final decisions up to God who has said, “Vengeance is mine” (Deut. 32:35; Rom. 12:19; Heb. 10:30). Ultimately, true wisdom is fearing and knowing the true God revealed in Scripture. It becomes accessible to us when we believe in Jesus and are born again. The Holy Spirit indwells us, and we become able to make wise decisions. We become able to understand the wisdom of God and the central necessity of the cross of Christ. We become able to extend true mercy, not just therapeutic forgiveness, to others. We live in submission to the Lord Jesus, and we find that He is, indeed, all we need. Copyright 2014 BibleStudiesForAdventists.com. All rights reserved. Revised November 17, 2014. This website is published by Life Assurance Ministries, Camp Verde, Arizona, USA, the publisher of Proclamation! Magazine. Contact email: BibleStudiesForAdventists@gmail.com.